� Total swept volume of 2800cc (172ci). 110HP @ 3700 RPM geared. Total engine diameter is 810mm (31.9"). 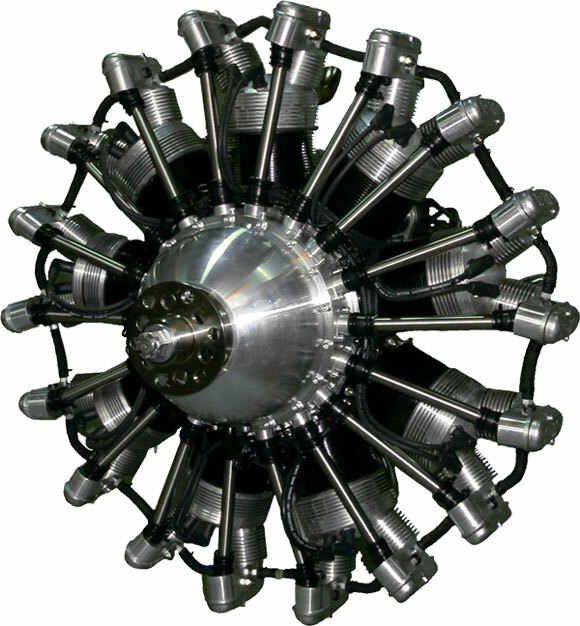 � Gearing is via a PSRU (Planetary Speed Reduction Unit) at a ratio of 3:2 Engine rpm:Prop rpm. 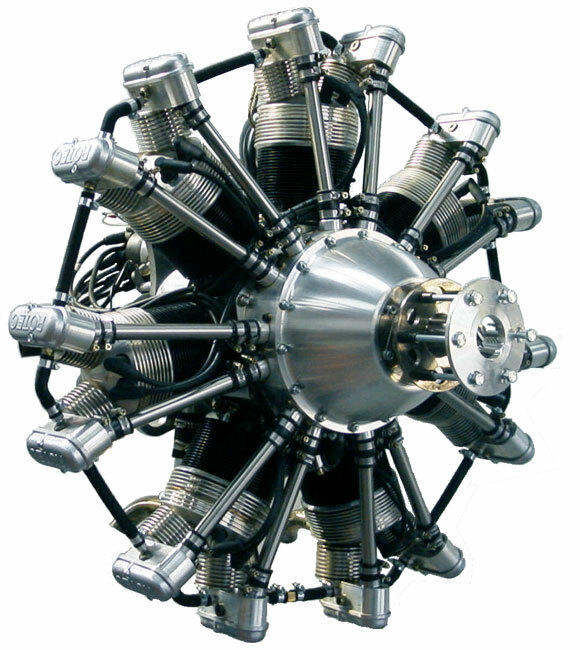 � Propeller / RPM Fixed 76" Diameter x 51"Pitch @ 2,400 RPM. � Fully machined aluminium crankcase and heads. Steel 4140 billet crankshaft, nitride hardened and ground, running on two large anti-friction roller bearings, propeller support and end thrust controlled by single deep groove ball bearing (all standard practice). Steel 4140 master and link rods deeply I beam sectioned and plain bushed, all lubricated by mains oil pressure. Steel 4140 cylinders precision honed to a perfect finish and exact tolerance. � The all important ignition system utilises two auto type spark plugs per cylinder independently fired by both a single self-energized magneto and Hall-effect 12 volt electronic ignition system, virtually eliminating total ignition failure when used in tandem. Timing is fixed at 25 degrees BTDC. � Electric 12volt starter motor (rear mounted) including built-in solenoid for reliable engagement and cranking. � 35amp alternator (small and also rear mounted) with built in voltage regulator. � Single Bing 40mm constant depression carburetor offering excellent automatic altitude compensating mixture control for an incredibly smooth delivery of power. Fuel supplied by engine driven mechanical fuel pump, an electric fuel pump (not included) is recommended for back up. Both fuel pumps are configured in series. � Dry sump lubrication via geared oil pressure and primary and secondary scavenge pumps. Auto style spin on oil filter are incorporated in the design. � Conventional valve train (two per cylinder) incorporating classic dual row cam rings and roller tappets for smooth valve movement via pushrod and 1:1 rocker transmission (all oil pressure lubricated). � All cams and bearing surfaces are nitride hardened and precision ground to exact tolerances. � Minimum octane 97 RON or 100LL aviation or high octane mogas are recommended. Compression ratio of 8.5 : 1 is standard. � Recommended TBO of 1000 hours. All engines come with a 12 month 200 hour warranty from date of purchase, whichever comes first. NOTE ALL WARRANTY CLAIMS TO BE ASSESSED AND CONDUCTED BY Rotec ENGINEERING PTY LTD (SHIPPING NOT COVERED BY WARRANTY). In a nutshell - In essence the R3600 is a R2800 with 2 additional pots. Modified prop hub to accommodate the additional power and torque. Will have a 3:2 PSRU for additional torque (resulting in 150+HP of usable power when compared to the output of a "Flat" engine).